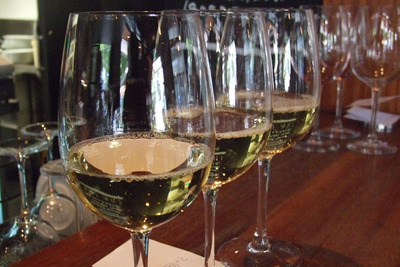 French food is famous for the use of fresh, local ingredients and for creating a wine list which complements the menu. 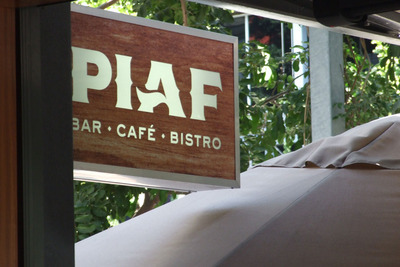 Piaf Bistro on Grey St at Brisbane's Southbank follow these gourmet traditions with a regularly changing seasonal selection of items for breakfast, lunch and dinner, and with an interesting, mostly European wine list to match. Don't expect an extensive menu or wine list, remember, this is all about pairing food and wine together according to the seasons. What you will find are five or six delicious main meal options which can be joined by tasty vegetable and salad dishes, all with a french influence. The menu changes regularly throughout the year, so each visit can be a whole new dining experience. I ordered the Beef sirloin with truffle mash and onion jus. The meat was tender, succulent and perfectly cooked to my specifications. My partner ordered the Atlantic salmon with fennel and sauce vierge. It was fresh and the sauce was warm and buttery. We shared the excellent side orders of grape and rocket salad with blue cheese dressing, and the chat potatoes with capers & parsley. Washed down with a glass of Beaujolais (me) and Riesling (him), this was one of the best meals I have had in Brisbane recently. Piaf Bistro is open 7 days from 7am, for breakfast, lunch and dinner. It is on Grey St at Southbank in Brisbane and includes indoor and outdoor cafe-style dining. Why? For seasonal french cuisine with a relaxed vibe.